2 of 5 In a large bowl, mix together peaches, berries, cornstarch, lemon juice and granulated sugar; set aside. 3 of 5 In a small bowl, stir flour, oats, cinnamon, salt and nutmeg. Add brown sugar; stir. Add butter and mix in by hand, mashing the butter pieces to form crumbs. 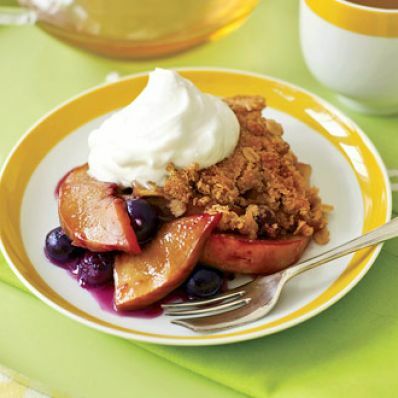 4 of 5 Spread peach-blueberry mixture into a 3-quart oval or rectangular baking dish and sprinkle oat mixture on top. 5 of 5 Bake at 350 degrees F. for 45 minutes or until golden brown. Remove to wire rack to cool slightly. Serve with whipped cream, if desired. 1 of 1 You can use frozen peaches when fresh are not available.